It's tough to imagine finding anything more valuable than piles of literal cash that have spilled from an armored truck, though a bunch of commuters in Atlanta this week found themselves driving through what was essentially a puddle of liquid gold, when a semi overturned and spilled its unfathomably expensive cargo: 40,000 pounds of printer ink. The crash, which occurred around 2am Wednesday on I-285 South, instantly transformed the interstate into what looked like a massive Rorschach test, when the truck lost control and flipped. Fortunately, no one was injured, but the incident did cause substantial traffic delays and left a massive stain on the roadway, complete with tire tracks extending from it in every direction. Despite the mess of it all, it's actually kind of beautiful? 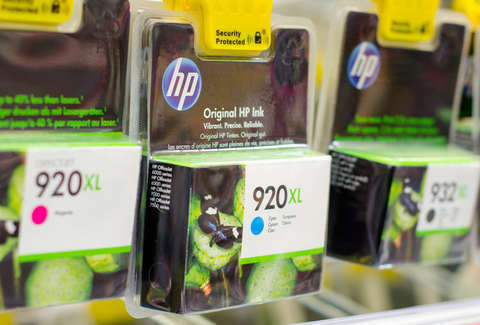 As you're surely aware if you've ever paid to replace a printer ink cartridge, the stuff is stupidly expensive. In fact, as Gizmodo points out, it's frequently cited as the most expensive liquid you can buy, and considering even the cheapest version of the stuff runs about $13 an ounce, it's entirely possible that this poor truck dumped at least $8.3 million worth of ink all over the road. And you thought overturning an 18-wheeler full of Fireball and frozen pizzas was bad news. In the immediate aftermath, fire and rescue crews tended to the mess by spreading dirt and sand across the roadway in hopes of soaking up the ink. However, it's unlikely the blotchy black section of road is going to return to normal anytime soon. Let's just hope this doesn't mean it's going to get even pricier to refill your printer.